203 Followers!! Wow!!! Thank you all for joining and taking the time to read my posts!! I truly appreciate all of your comments. I am in the process of deciding what to do for a giveaway and hopefully shall come up with a really good idea in the next couple of days. I have had quite the busy week and weekend as usual...not a lot of stitching done! I did, however, manage to get all my DMC threads on bobbins!! Titus enjoyed this process a lot! He loved the dangling threads and more than once, I had to finesse the threads from his mouth and claws!!! Funny how much time it takes to put threads on a bobbin. It took me over 3 hours to do it! Though it is really satisfying to have the threads organized. I've made a bit more progress on Jane, adding a couple of stitches here and there each night. I'm still holding off stitching the satin stitch snake. I think I'm a bit chicken about attempting it on linen. I've satin stitched before, but on fabric that wasn't so porous. Have any of you satin stitched on linen? I feel that it will be hard to keep a smooth line while trying to stitch the curves in the snake. The pattern suggests using a pencil to lightly draw an outline, but I'm scared to muss up Jane! She's precious to me and I don't want to make any mistakes. I've thought about getting one of those quilting pens and trying that out instead of a pencil. What do you think? Gray, rainy day makes for sad gray photos! It's been raining a lot lately. A bit of sun on Friday and that's about it....just more rain, and more rain, and rain, ooh, there's some more...will there be more tomorrow? Probably!! 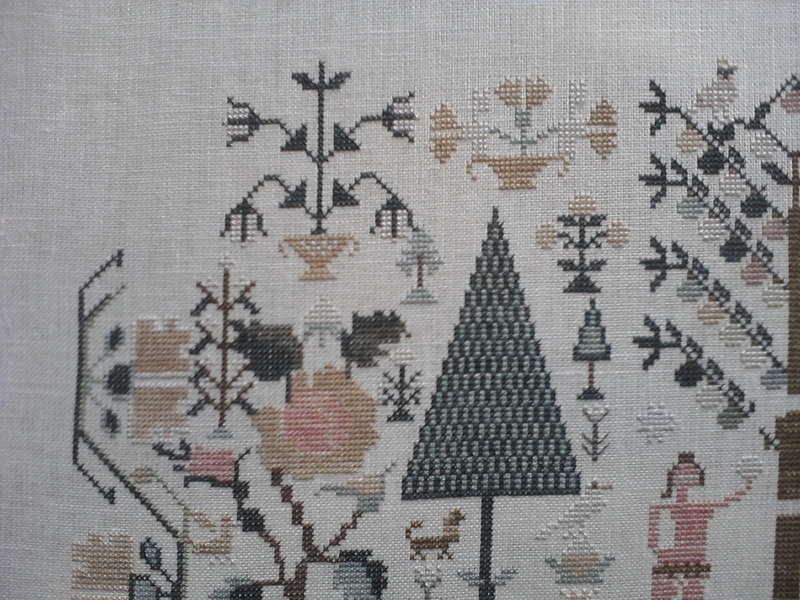 Some of you have been asking about Knotgarden and when will I stitch it. When I get the kit!! I think the ECC is back logged with orders so it might take a little while longer to get my kit. Ooooh, having a hard time waiting!!! I am really eager to sink my teeth into a big Chatelaine!! This is bad because I already have two BAPs on the go. I really should give some TLC to my Tea Bath Fairy. She hasn't been touched in awhile. This weekend will be a lot less busy so I will give her some of my love then. So today is the last day to get any of the Gift of Stitching magazines for 50%!!!! On Friday, before I went out, I decided to purchase the entire 2009 bundle because there was a Chatelaine design I wanted, plus an Ink Circle design too! It's sad that Kirsten can no longer produce the magazine due to piracy issues. A great loss to the stitching community. I think I will go back and order some more back issues today seeing as it didn't cost me much and I got my magazines instantly! 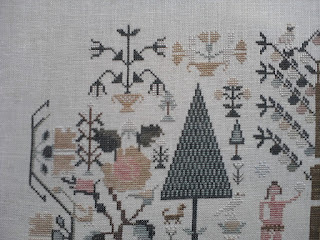 There are tons of great designs I want to stitch and loads of lovely articles to read!! You should also check out this great little blog called The Stitching Gift that was started by Jo from Serendipitous Stitching, Denise from Stitching at Grandma's House, Debbie from Needles and Words and Gillie from Random Thoughts from Abroad. 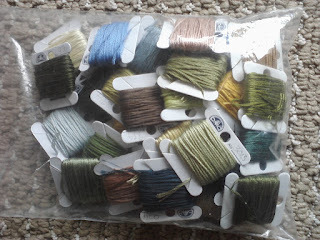 Looking through the Stitching Gift blog had me drooling/wanting past GOFT issues, hence why I bought a bunch!!! I think I have more than enough designs to work with for quite sometime now!!! This post hasn't been all that exciting, but sometimes that's how it is!! When all else fails, a picture of Titus always seems to be a crowd pleaser!! So here he is from the same "Yoga" batch from last week. 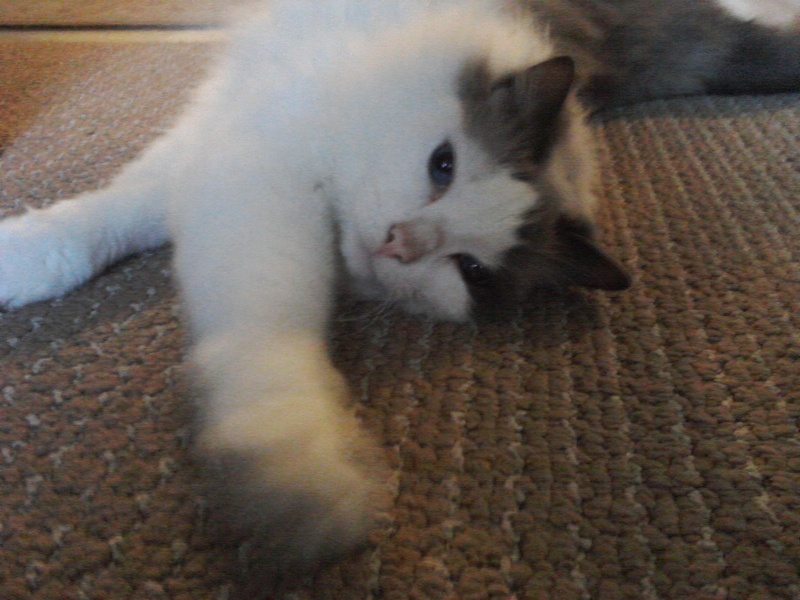 He plans on starting his own Yoga class :D LOL!!!! I think this is the upside down Lotus sprawl...I have no clue about Yoga names!!! Hugs to all and happy stitching!! It is amazing how long it takes to transfer thread to bobbins isn't it? But, it does feel good when it is done! I love the photos of your newly wound bobbins of DMC, they looks so organised. Your sampler is looking great, not sure what I would do with the snake though. Titus is so cute and he looks very relaxed. OOOOOOOOH, the last photo made me forget everything else I was going to say! hahahaha I love that BELLY! Titus is adorable! 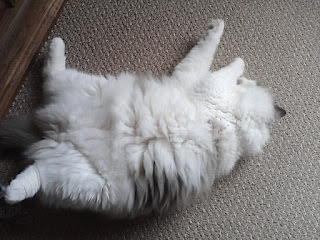 Love the way cats have to show off their bellies. Jane is looking really good - unfortunately my embroidery skills aren't too good which is why I stick to the little x's, which means I can't help with the satin stitch snake. Look forward to seeing how you tackle him! Don't your floss bobbins look all neat & tidy. My boys have great delight trying to play in my floss collection whenever it is out as well! Good for you on the bobbin winding. I have so many to do it's daunting. I am only on the 600 series and I have the whole set! Jane is really coming along! I am tempted to start my Chat too but I can only handle one BAP at a time. I'll get all stressed out! Glad to hear you had a nice weekend! I love floss winding. I use those bobbins too. When I get tired of stitching, winding is a nice break. Your sampler is looking good. No help on satin stitching here. Mine is always pretty 'rustic' (my term for sloppy). I do the same thing that you do when I get ready to stitch on a picture. 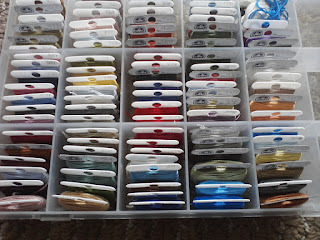 I have to have all of my threads organized and in the Darice Floss Storage Box. I found your Blog through Edgar's Blog and I dearly love your Blog. I too have a Blog and I would love for you to be a follower on mine as well. I am now a follower on yours. I also keep my threads on bobbins bit I don't enjoy the winding process, doing it for three hours ould drive me nuts! I've never enjoyed winding the floss so I finally switched to using the floss bags on rings instead. Every time I sit down to stitch Clarisse makes an appearance and just waits until that floss dangles within her reach. Then she pounces on it and tries to take off with it in her mouth! At times the floss is so wet I have to use another piece! You've been so good at getting organized! Your floss looks great! Jane is looking prettier by the minute! I am so sad a bout the Gift Of Stitching :( I am glad that you were able to buy some issues. Putting your floss on bobbins is a huge project. I can see ow Titus thought he could help. Jane is looking wonderful and I'm sure your satin stitches will look fine. Maybe practice on a small remnant of the same linen? I've satin stitched on linen, but only in small doses. There was a lot of it in the Nature's Alphabet that I finished last month. I've never satin stitched on linen either, so I'm afraid I'm not much help. But I CAN tell you that it takes me far longer than three hours to wind all my threads onto bobbins - lol. Titus is, as always, absolutely adorable. Keep stitching, Anne! I'm DYING to see your Chatelaine start! It only took you 3 hours to wind all your DMCs on bobbins? It took me days to do mine. LOL! And after that, I had a sore wrist. Hmm... I've satin stitched on linen before for a Just Nan design but I can't really give you any advice on the snake as I'm not sure how different it is. Never had to draw any outline for the Just Nan design :/ Hope you work it out soon. I bought a couple of back issues of GOS. I used to sub to it and have lots of issues and everytime I look through them I find something else that I was to stitch! LOL, love the photo of Titus. What a chubby kitty! Congrats on getting your DMC on bobbins. When I started stitching over 25 years ago (Shhhh! ), bobbins was the recommended way to store threads so that's how I've always done it. 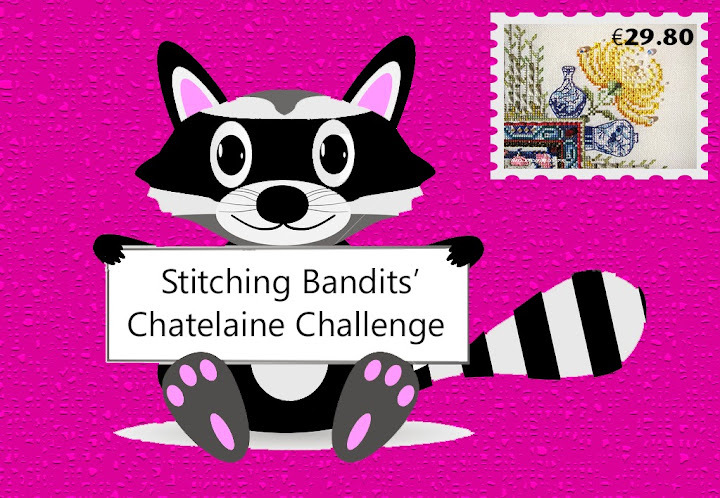 Do you know there's a Chatelaine blog? If you're interested in joining, let me know and I'll send you the blog address. Lovely stitching, takes me an age to get all my threads sorted, now I am putting them in little plastic bags. You should be fine with the satin stitching. I think that if you're working on scroll rods it will go easier as the fabric is more taunt. And use a laying too if more than one thread so that it lays flat. Oh... you have stitchy pics.... ah yes... gotta.... TITUS.... comment on.... TITUS..... them to.... TITUS!!!! ROFL!!!! I have satin-stitched on linen (many times!) and it's not that different from canvas, except you have to have a slightly looser tension. Not so loose that your threads puff up; you just don't want to pull those linen threads out of their track. You can still use a laying tool or "railroad" them to help how they lay. For your snake outline, you could always use a non-divisible thread to baste in the outline. Sulky and Gutermann make good ones (look in the sewing section) that are essentially really, really, really thin strips of plastic (metallic), so they don't get caught up on anything. When you're done, you can just pull them out. The quilting pen could work, too...but I have heard one story about the air-erasable one coming back! Stick with the water-erasable one if you go that route. Good luck!! Stitching, Lovely Visits and Loads of Photos! !